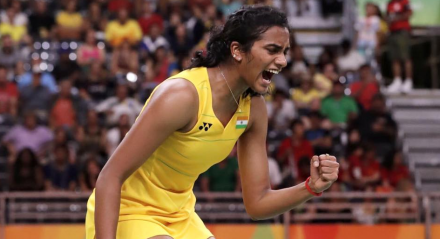 PV Sindhu created history and ensured India would walk away with a medal in the ladies singles badminton tournament as she defeated Japan’s Nozomi Okuhara 21-19, 21-10 to enter the final at the 2016 Rio Olympics. Sindhu used her height and better serve to her advantage as she raced away to a 3-1 lead in the first game. Okuhara hung in and managed to keep touch with the Indian but Sindhu continued to maintain her advantage. A couple of unforced errors reduced Sindhu’s lead to 15-13 but the Indian held her nerve and clinched the first game 21-19. In the second game, Okuhara started better and pulled things back after Sindhu had raced away to an early lead. At 9-9, the game was delicately poised but Okuhara made some errors and her judgment at the net was poor as Sindhu seized the initiative to win 11 straight points and win the second game 21-11. With this win, Sindhu became the first Indian female badminton player to enter the final of the ladies singles event in the Olympics. In the final, she will play Carolina Marin for gold.